Councilmember Jim Graham (D – Ward 1) informed his constituents via email this afternoon that the Deputy Mayor for Economic Development will rebid the construction contract for the park project in LeDroit Park. The project is back on track, but the rebidding process will necessitate a delay of several months. The D.C. Council voted unanimously to reorganize the controversial park construction contracts. Ten of the contracts will be managed by the Office of Public Education Facilities Modernization, which mainly handles school reconstruction. The office is highly regarded as efficient and reliable. Three of the contracts, including the one for the park in LeDroit Park, will be handled by the Department of Parks and Recreation and not the Housing Authority as originally planned. Banneker Ventures, which had received all of the original contracts, is threatening to sue the city for a breach of contract. 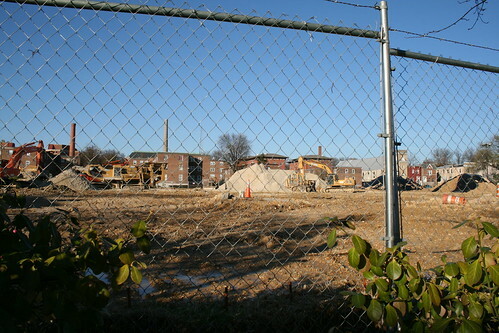 D.C. Attorney General Peter Nickles believes Banneker has strong legal footings upon which to build a case; the Council is not so sure (or doesn’t care). Councilmember Jim Graham (D – Ward 1) believes the three contracts directed to the Dept. of Parks and Recreation may be able to go forward as originally planned because of the more open nature of their original approval. Perhaps our local mud pit will open next year as verdant as planned after all. We wrote earlier about the rebirth of DC’s streetcar system and even suggested our own alignment for a full-length Rhode Island Avenue line. The streetcars will be transported to the Greenbelt Metro railyard, where WMATA staff will maintain them until the tracks are ready. 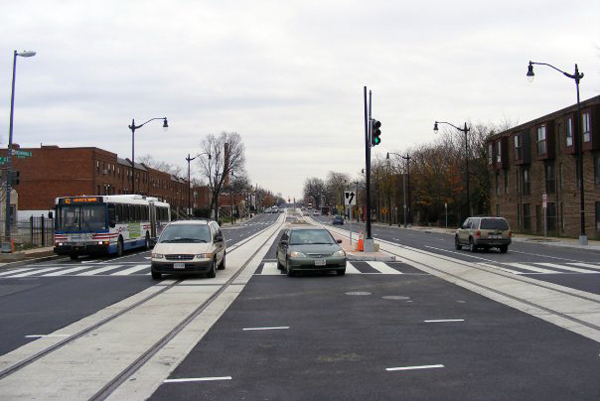 Speaking of tracks, DDOT has finished laying down the streetcar tracks along Benning Road in Northeast. DDOT took this photo on Benning Road NE at 17th Street NE, just two blocks outside the L’Enfant Plan, where overhead catenery wires are prohibited by law— another issue DDOT will have to resolve. DDOT is ambitiously moving ahead with the streetcar plan, but Councilmember Jim Graham (D – Ward 1) told us that though he may not see the streetcars in his lifetime, I’d see them in mine (you’re writer is 25). Not fully reassuring, but better than nothing. The Metropolitan Police Department, Councilmembers Jim Graham (D – Ward 1) and Harry Thomas, Jr. (D – Ward 5), and the local ANC commissioners are hosting a public safety meeting tomorrow (Tuesday) night at 7 pm at the Mt. Pleasant Church at Second Street and Rhode Island Avenue. The meeting will address some of the recent violence in the two neighborhoods. Yesterday’s Council hearing, one in a series on the parks debacle, revealed an expedited (but opaque) process for awarding park renovation contracts. The Housing Authority issued a Request for Qualifications (RFQ), which simply determines which companies have the ability and experience to bid on the final contract. An RFQ saves time by eliminating groups who do not have the ability to follow through on a project. The second step is supposed to be a Request for Proposals (RFP), in which the qualified bidders submit cost estimates and designs. The submitted proposals are what the city government and public review and debate until a final selection is made. In response to the RFQ, a five-member panel composed of officials from the Housing Authority and mayor’s office selected Banneker Ventures, a firm owned by a close friend of the mayor, from among 13 applicants. Recall that this step is merely supposed to determine who is qualified to proceed to the next step to bid on a contract. Well, the administration decided it should end there and, after selecting Banneker as qualified, did not issue an RFP and just handed the $82 million in renovation work to Banneker to manage. Banneker was awarded $4.2 million to manage the work to be performed largely by other firms. None of this was done with Council approval, as required by law, and on Tuesday the Council voted on emergency legislation to restrict funneling of park money through the Housing Authority and to require the Housing Authority to notify the Council of all contracts above $75,000.